Holiday cheer is in the air! People are busy decorating their homes, baking cookies, picking out the perfect Christmas tree, and, of course, shopping for gifts. In my experience, one of the most difficult family members to shop for is my dog. I know what you might be thinking—it can’t be that hard to make a dog happy. And you’re right. 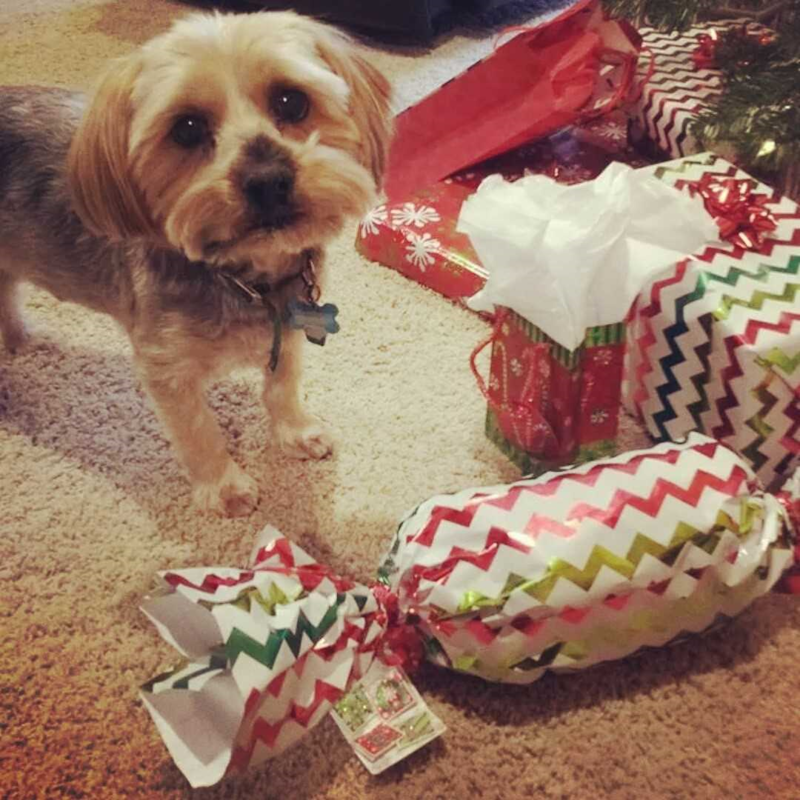 It’s not hard to find a gift that my pup will enjoy. The real challenge is finding a one that will last more than a few minutes before he has it torn to shreds. Interactive Pet Camera: Do you ever wonder what your dog does all day while you’re at work? Well now you can find out thanks to pet cameras like Pawbo, Furbo, and PetChatz. These interactive pet-cams allow you connect with your furkids even when you aren’t home. For example, PetChatz offers two-way video calling, a game mode, treat dispenser, and more. The price for an interactive pet-cam varies based on the type of features the device offers, but you can expect to spend between $100 and $300. Monthly Subscription Box: Give your dog the gift that keeps on giving by signing up for a subscription box like BarkBox or PupJoy. Every month, a new box filled with toys, treats, and other dog-friendly products will arrive on your door step for Fido to enjoy! Pet Massager: Have you ever thought about giving your dog a massage for Christmas? It might sound kind of silly, but it can actually be very beneficial for your four-legged friend. A massage can decrease their stress and anxiety, reduce pain, improve circulation, and promote overall well-being—just like it does in humans. For less than $20, you can purchase a quality dog massager from PetWell and help your four-legged friend relax all year long. Ball Launcher: If your dog loves to play fetch, then a ball launcher is the perfect gift to put under the tree. Keep things simple by purchasing a low-cost, hand-held launcher like Chuckit!, or give your dog a physical and mental workout with an interactive ball launcher like iFetch. Doggie Water Fountain: More often than not, when you set a bowl of water outside for your dog it gets warm, filled with debris, or knocked over. Doggie water fountains, like The Pawcet, provide your dog with a clean, fresh water supply so they can stay hydrated even when you’re not around. Fence Window: If your pooch loves to see what’s happening beyond the backyard, consider buying a fence window like PetPeek. These fun, porthole-style windows allow curious dogs to see outside their fenced-in yard, which can help deter them from trying to escape. Dog Boots: Doggie shoes might look a little strange, but they actually serve an important purpose—protecting your canine’s paws from snow, ice, salt, cold, and heat. They also help keep your dog healthy by preventing their paws from collecting allergens, chemicals, and mud. Some of the most popular brands of dog boots include Ruffwear, Ultra Paws, and Pawz. August is a Communications Intern at TDS Telecom and a journalism student at UW-Madison.